AS we power towards the end of 2013 and after over 10 years in the industry, Stefanie Schneider presents ‘The Girl behind the White Picket Fence’, her first feature film. Since Polaroid stopped making film, Schneider has made it her goal to collect as much Polaroid film as she could possibly find, and that’s where it began… Trucks began delivering box after box of Polaroid film, which later turned into years of work in script writing, filming, prop production, and prepping actor contracts. ‘The Girl behind the White Picket Fence’ is an analog film. Varying in speed, tone and emotion, the film is an insight into Stefanie’s mind as she explores sunny, hot, in love, open spaces which she says “evoke freedom but also banishment”. In this project, each actor was invited to write his or her own story of love that Schneider then pieced together to make some sense of fate. This film is about old fashioned analog beauty, combining love and life choices. It’s a film about searching, about truth and sometimes about where that truth takes us which began its development as a grand idea that Schneider then explored further to make a reality, with all participants coming from Stefanie’s time in Hollywood, from directors to actors, producers to agents, writers to weirdos. After funding was secured and the collecting of material for the script was complete, Caroline Haertel from ‘micafilm’ in Berlin joined Schneider, who then brought with her Kirsten Niehuus (Medienboard Berlin-Brandenburg) and Barbara Haebe (Arte). The whole team were incredibly supportive. Last but not least, after everything had been shot, scanned and then finally sequenced into 4,000 Polaroid photographs, ‘The Girl behind the White Picket Fence’ was born. A story about past love, present and future love. 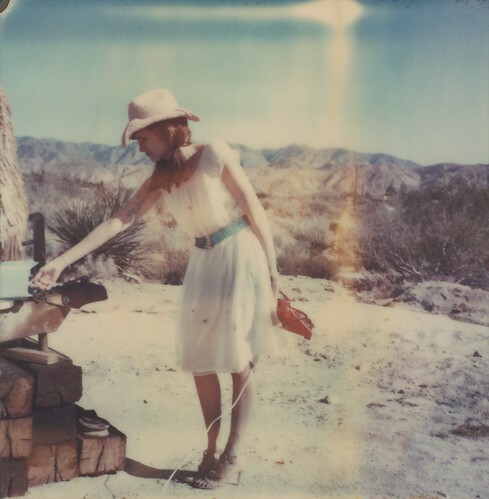 Emotions are poignantly explored while clashing with the brilliant colour of the Polaroid film. This is a Polaroid analog film experience about love that flirts with the serendipity of our subconscious. This idea was born before the current hipster trend. Before Instagram photography was even thought of.